While we were in Vegas last month my Blackberry Curve died a terrible death. It was only 14 months old! I had plugged it in and gone to bed. I woke up in the middle of the night and picked it up to use it as a night light to get me to the restroom. I got into the restroom and turned the phone around and looked at the screen. Where all the icons should have been was just a big white screen with a box. Inside the box was a triangle, circle, & a square. Around the box was the ghostbusters symbol. I tried to turn it off. I pressed all the keys. NOTHING worked. The screen stayed white with that bizarre symbol. While pressing buttons the trackball fell out and rolled across the floor. 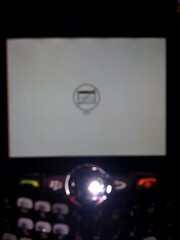 Well, once the little trackball is gone you can’t use the Blackberry at all! The only think that worked was pulling out the battery. When we got home I took the phone to the cell phone place and asked the rep if it could be fixed. She took one look at it and declared it dead beyond repair. She said she’d never seen that screen before. This makes 3 broken Blackberry phones in the last 2 years. They all just up and died mysterious deaths! My first Blackberry lasted me over 2 years but then one day just wouldn’t charge anymore. Took it in and nothing could be done for it. Then my first Curve did the same thing when it was just a month old. Now this. Safe to say I will never give Blackberry another dime of my money.